Picture this - you're planning on voting on Election Day and something you couldn't prepare for happens, like a family or medical emergency. 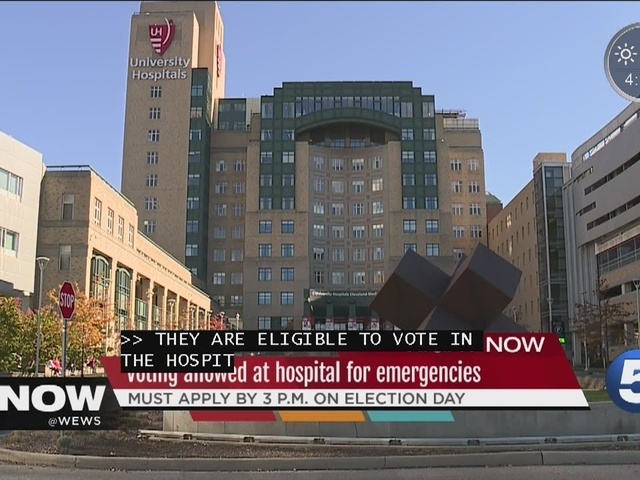 News 5 found options for those who can't make it to the polls - hospitals. "They are eligible to vote there in the hospital," Cuyahoga County's Board of Elections director, Pat McDonald told News 5. Patients who were admitted after noon this past Saturday and before the Election deadline can vote from their hospital bed. "As long as they apply to us by 3 p.m. on Election Day," he said. A University Hospitals spokesman told News 5 all hospital employees are notified. A special hospitalized absentee ballot application is filled out at the hospital and sent to government relations. They check it and give it to a party representative from the board of elections who then delivers the ballot to be counted. The parents of hospitalized children can also vote from the hospital. "We typically in a presidential election, we have about 300 people who vote at a hospital. As of today, we have had 7, but mainly they come in on election morning," McDonald told News 5. However, if something happens on Election Day after the deadline, there are no extra accommodations. McDonald said the county elections office needs a properly completed and signed hospitalized ballot request by 3 p.m. Election Day. "After 3, sorry to say, they are out of luck. The deadline is 3 o'clock on Election Day," he said.